Shrimp paste or shrimp sauce, is a common ingredient used in ASEAN cuisine. It is known as terasi (also spelled trassi, terasie) in Indonesian, ngapi (ငါးပိ) in Burmese,kapi (กะปิ) in Thai, Khmer (កាពិ) and Lao language (ນໍາກຸ້ງ), belacan (also spelled belachan,blachang) in Malay, mắm ruốc, mắm tép and mắm tôm in Vietnamese (the name depends on the shrimp used), and bagoong or alamang in Filipino. It is made from fermented ground shrimp mixed with salt. Some versions are in its wet form such as those in Vietnam and other versions are sun dried and either cut into fist-sized rectangular blocks or sold in bulk. It is an essential ingredient in many curries and sauces. Shrimp paste can be found in most meals in Myanmar, Laos, Thailand, Malaysia, Singapore, Indonesia, Viet Nam and the Philippines. It is often an ingredient in dip for fish or vegetables. 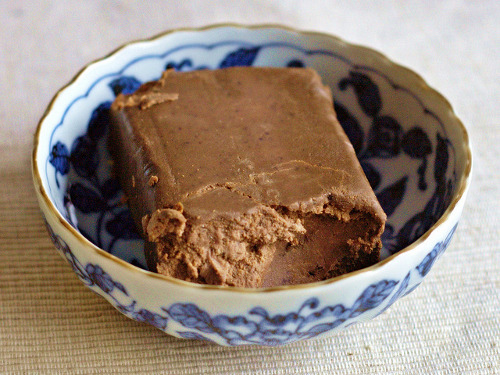 Shrimp pastes vary in appearance from pale liquid sauces to solid chocolate-colored blocks. 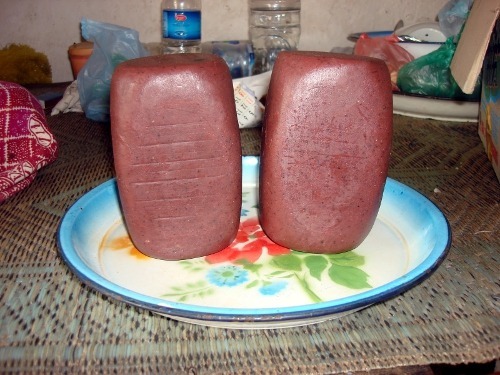 Shrimp paste produced in Viet Nam is typically a light pinkish gray while the type used for Burmese, Lao, Cambodian and Thai cooking is darker brown. While all shrimp paste has a pungent aroma, that of higher grades is generally milder. Markets near villages producing shrimp paste are the best places to obtain the highest quality product. Shrimp paste varies between different Asian cultures and can vary in smell, texture and saltiness. Belacan, a Malay variety of shrimp paste, is prepared from krill, also known as geragau in Kristang (Portuguese creole spoken in Malaysia) or rebon in Sundanese and Javanese. In Malaysia, normally the krill would be steamed first and after that are mashed into a paste and stored for several months. The fermented shrimp are then prepared, fried and hard-pressed into cakes. William Marsden, an English writer included the word in his “A Dictionary of the Malayan Language” published in 1812. Belacan is used as an ingredient in many dishes. A common preparation is sambal belacan, made by mixing toasted belacan with chilli peppers, minced garlic, shallot paste and sugar and then fried. Sometime it is toasted to bring out the flavour, but that creates a strong odor. Terasi (trassi in Dutch), an Indonesian variant of dried shrimp paste, is usually purchased in dark blocks, but is also sometimes sold ground. The color and aroma of terasi varies depending on which village produced it. The color ranges from soft purple-reddish hue to darkish brown. In Cirebon, a coastal city in West Java, terasi is made from tiny shrimp (krill) called “rebon”, the very origin of the city’s name. In Sidoarjo, East Java, terasi is made from the mixture of ingredients such as fish, small shrimp (udang), and vegetables. Terasi is an important ingredient in Sambal Terasi, also many other Indonesian cuisine, such as sayur asam (fresh sour vegetable soup), lotek (also called gado-gado, Indonesian style salad in peanut sauce), karedok (similar to lotek, but the vegetables are served raw), and rujak(Indonesian style hot and spicy fruit salad). On the island of Lombok, Indonesia, a more savory and sweet shrimp paste called lengkareis made. Bagoong, or alamang, or “Ginamos” (in Western Visayas) is Filipino for shrimp paste, made from minute shrimp or krill (alamang) and is commonly eaten as a topping on green mangoes or used as a major cooking ingredient. 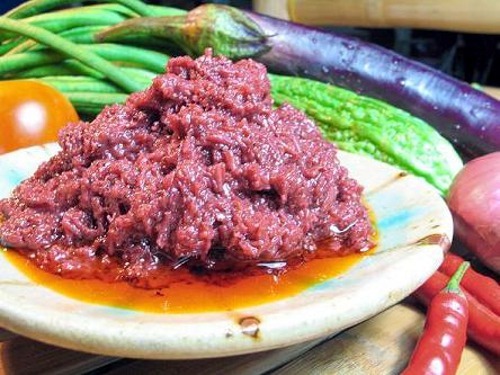 Bagoong paste varies in appearance, flavor, and spiciness depending on the type. Pink and salty bagoong alamang is marketed as “fresh”, and is essentially the shrimp-salt mixture left to marinate for a few days. This bagoong is rarely used in this form, save as a topping for unripe mangoes. The paste is customarily sauteed with various condiments, and its flavour can range from salty to spicy-sweet. The colour of the sauce will also vary with the cooking time and the ingredients used in the sauteeing. 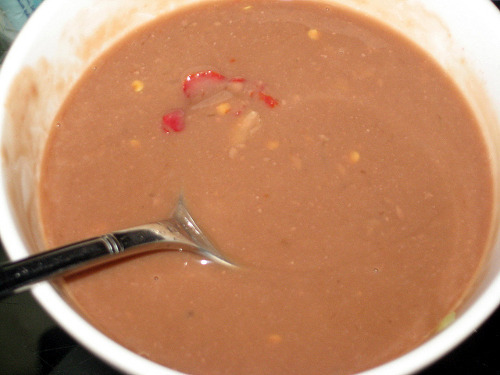 Cincalok is the Malaysian version of ‘fresh’ bagoong alamang. Unlike in other parts of ASEAN Region and in Western Visayas, where the shrimp isfermented beyond recognition or ground to a smooth consistency, the shrimp in bagoong alamang (in many parts of the Philippines) is readily identifiable, and the sauce itself has a chunky consistency. A small amount of cooked or sauteed bagoong is served on the side of a popular dish called “kare-kare”, an oxtail stew made with peanuts. It is also used as the key flavouring ingredient of a sauteed pork dish, known as binagoongan (lit. “that to which bagoong is applied”). The word bagoong, however, is also connoted with the bonnet mouth and anchovy fish version, bagoong terong. 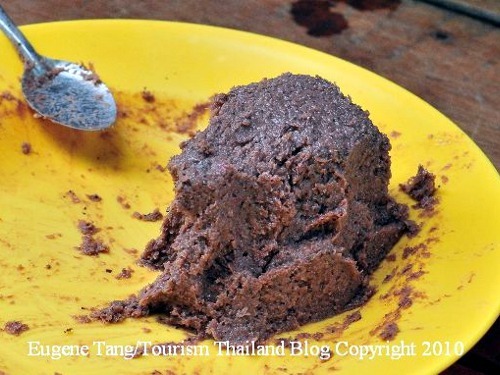 In Cambodia, Laos and Thailand, shrimp paste (kapi) is an essential ingredient in many types of nam phrik, spicy dips or sauces, and in all Thai curry pastes, such as the paste used inkaeng som. 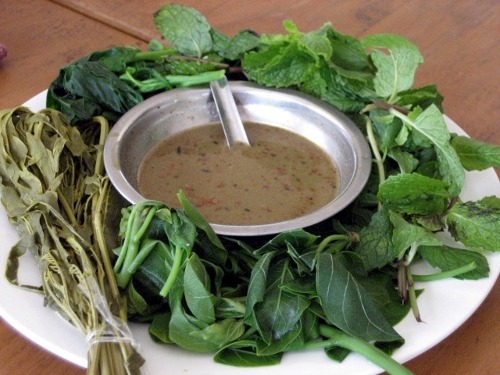 Very popular in Thailand is nam phrik kapi, a spicy condiment made with fresh shrimp paste and most often eaten together with fried pla thu (Short mackerel) and fried, steamed or raw vegetables. In Southern Thailand there are three types of shrimp paste: one made only from shrimp, one containing a mixture of shrimp and fish ingredients, and another paste that is sweet. Mắm ruốc is a sauce made ​​from shrimp paste form (a small species of shrimp belonging to the genus Acetes Sergestidae, the Decapoda). However, the color and the taste is not the same with shrimp sauce. No fishy shrimp sauce with shrimp paste, add water as possible for sauce and can be used as spices in cooking vegetable in ASEAN Region. Belachan or balachan is nothing new to me but for my two kids aged 7 and 9, it is really something that they hates if it uncooked!! Even my mother-in-law refused to cook dishes uses belachan as she complained it is very smelly. In fact, it is if uncooked! But once it is cooked (after frying in oil), I will say it emits a nice aroma that make a lot of people likes it including me. A lot of people likes the sambal balachan when they frequent Malay food stores that is made from shrimp paste plus chilli plus lime. My mother used to prepare this and we even just dip raw cucumber with this simple sambal belachan sauce. I tend to believe what make a good sambal balachan and a smelly one is a critical process ofensuring that the balachan is cooked before you add to your chilii. Last time, we used to put it over small fire (under charcoal) until the fragrants comes out (like barbeque of chicken wings), only then we mixed it with chilli, pound it and add some sugar and lime before we serve it as a source. I really missed this. If you don’t cooked it, it will be very smelly!! As most families in Singapore and Malaysia do not have charcoal stove, one way you can use is to pan fry Belachan over the gas stove over very very small fire until the fragrants comes out. Belachan though is considered as a Malay cooking ingredient, however, it had been well accepted by the Chinese communities in Singapore and Malaysia. Common belachan dishes in Malaysia and Singapore Chinese community are kangkong or water spinach (甕菜) fried with balachan and belachan chicken (虾酱鸡). Besides kangkong, we fried with lady fingers, long beans, paku or midin, durian flowers, etc etc etc… If you like more creamy, you can add coconut milk (or lemak as in Malay). Ya, a friend of mine remind me of a specialty in my home town, Kuching, Sarawak, Malaysia. The Chinese hawkers in Kuching do/used to sell something called balachan beehoon. It is actually quite smelly but if you get used to it, you will like it. It is just balachan (without frying), meshed it, mixed with pounded shallots and cooked in a pot of water. Shall i call it “Belachan Soup”? LOL. It was served with rice noodles, sliced cucumber, eggs and “preserved” squid (don’t know how to call it).. Just like durian, it is an acquired taste, either you like or dislike it. I used the terms “used to sell” is because nowadays, it does not appear to be a popular roadside hawker stall item. I wonder if I could still find it when I am back to Kuching. Lastly, on one trip to Hong Kong, i was surprised to find it in the Lantau Island (if I am not wrong). Cheers to balachan for the role of “uniting” the Asean nations. This entry was posted in Interesting Cooking Ingredients Series and tagged asean, balachan, belachan, Chinese meals, Cooking Ingredients, malaysia, Shrimp paste, singapore. Bookmark the permalink.